Yum! This looks delicious. I can't wait to try it. Yummy!!! Thanks for sharing at Submarine Sunday! 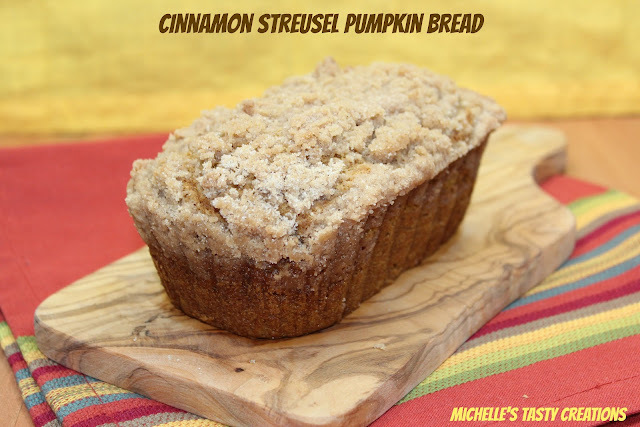 I love pumpkin bread and the streusel topping put this over the top! Thank you for coming by and linking up to Wonderful Food Wednesday. This recipe looks outstanding! Can't wait to try it. I'm having my coffee right now, and this would be JUST PERFECT alongside it. Yummers! Thanks for coming to party with us at Whimsy Wednesday! Your pumpkin bread sounds wonderful. I love streusel toppings! My weekend blog hop, The Gallery of Favorites, is live now and I would love it if you would share this delicious treat. Yummy! Thanks for sharing on Marvelous Mondays, Michelle! Looks delicious. I love pumpkin bread and the streusel topping makes it sound even better. Glad I saw this on Fabulous Fridays! Your Cinnamon Streusel Pumpkin Bread looks delicious! Hope you had a great week end and thank you so much for sharing with Full Plate Thursday. This looks so good. I wish I had a slice for tomorrow's breakfast! I pinned it so I'll make it soon! Michelle, this looks SO good - I can't wait to get my kitchen in order so I can bake it! These look AMAZING Michelle! Perfect for Thanksgiving :)Thanks so much for sharing at Mom On Timeout! Happy Halloween! It looks so amazingly delicious! And I love the detailed instruction pictures.